I kind of liked the book, Eat, Pray, Love. Not enough to recommend it to anyone, but I did like the title. A lot. In a damn-I-wish-I'd-thought-of-it-and-then-written-a-bestseller kind of way. And I was keen to watch the movie. Only because I wanted to see Javier Bardem. But I fell asleep during the Pray - India part. And I love India. I did, however, perk up during Bardem's scenes. But the best part of the movie is that it featured my favourite (and now probably everyone else's) pizza place in the whole wide world. L'Antica Pizzeria da Michele has spoilt pizza for me. 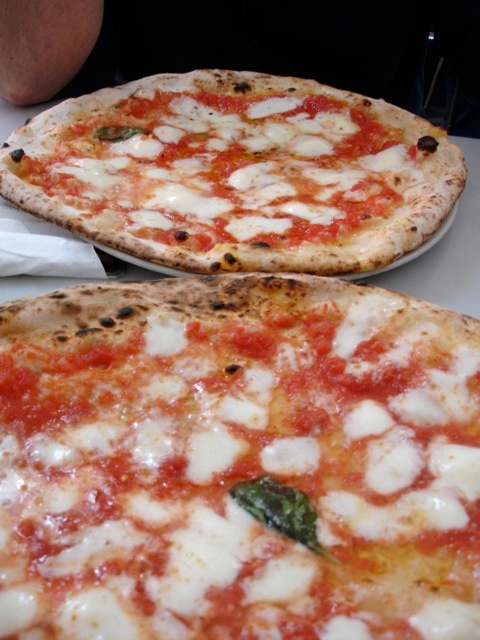 Every pizza I've eaten since eating there, has left me feeling bereft and longing for the pizza I ate there in the dirty streets of Naples. We used to (Previous Life - Wench of the high Seas) sail in and out of Naples every 10 days. 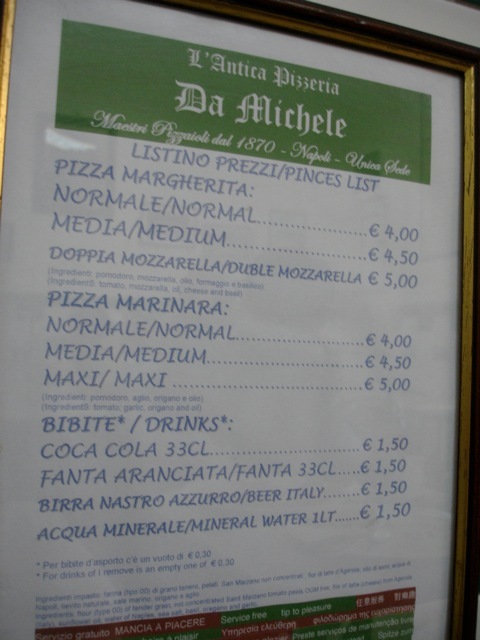 And every single visit used to involve a pilgrimage to Da Michele. We'd briskly walk the 40 minutes it took to get from the port to the pizza, few are mad enough to brave Naples traffic in a cab, dodging the maniacal scooter drivers and anticipating our Margherita pizzas with extra mozzarella. Da Michele is famous for the large pizzas they make using cow’s milk mozzarella, Sarno Valley tomatoes and vegetable rather than olive oil. 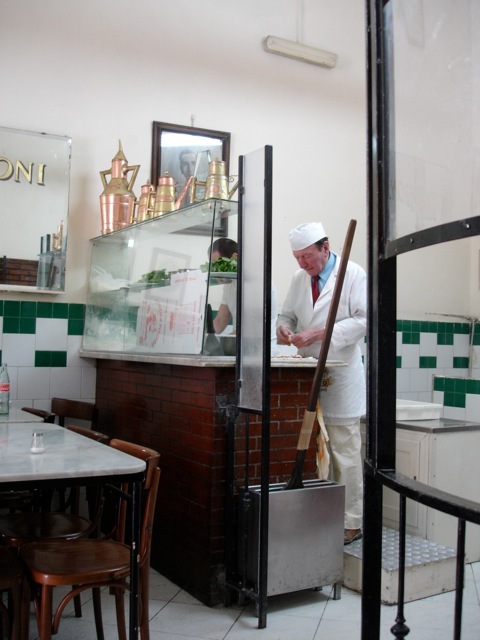 This is the way the owners, the Condurro family and descendants have been making pizza since 1870. In this functional white-tiled, marble- tabled pizzeria, the family of pony-tailed, gold-chain wearing pizzaioli man the wood-fired ovens, stretch out the dough, take smoke breaks on the pavement and take orders from a very limited menu. 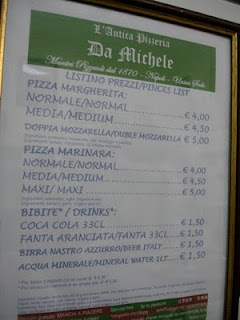 The choices are simple, Marinara or Margherita, Beer, Coca-Cola or water. That’s it. Nothing else. It is a beautiful thing to watch the patriarch, an old man who wears a white apron over his blue suit, lovingly spread fresh tomatoes with arthritic hands on the stretchy dough, before adding a fistful of mozzarella and placing a single basil leaf in the centre of the pizza. A pinch of salt and a swirl of oil signals that one of the younger boys can place the wooden spatula on which the pizza rests into the oven. 63 seconds later a sublime, thin, softly blistered, chewy base covered with melted mozzarella and tomato is placed before you, to be eaten by hand, divided into four, each piece folded in half and eaten quickly before the topping slides down your chin. Elizabeth Gilbert did not need to travel to three countries in order to find herself or her answers. She could have stopped searching in Naples, once she's reached Da Michele. As I did. For here, in this small white-tiled pizzeria, I ate. I prayed. And I loved. Of course you've been to Da Michele! Between that and meeting Joanne Harris, you have lived the life I dream of! Now...i'm off to find some pizza! I am salivating at the thought of those pizzas! Italy is my favourite country but we have never been to Naples! Sigh. Thank you for such an evocative post. Just what my soul needed: a reminder of the joys of Italy - and pizza. Thank you Vanessa. 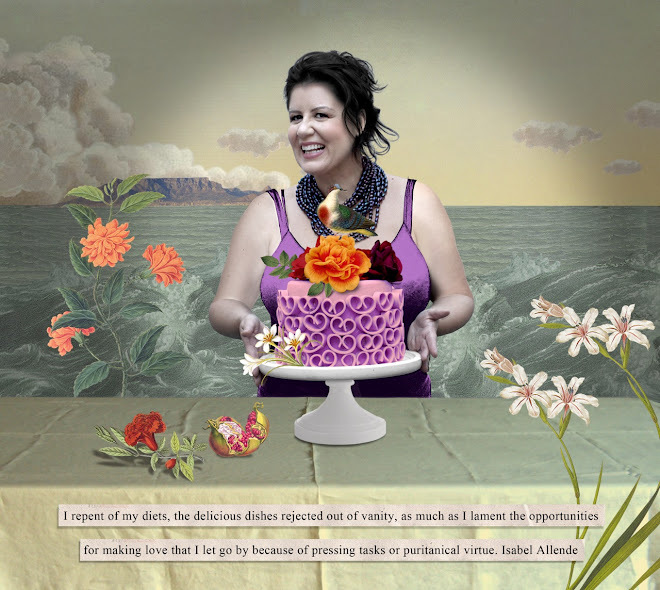 And yes, the Italians can teach us so much about joy. In pizza form. And otherwise. Ooh yum. 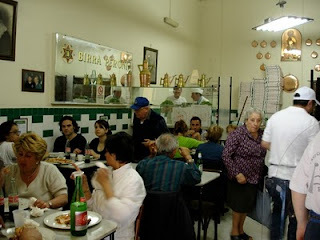 We had a similar pizza experience in, of all places, Buenos Aires. It was the best I've ever had (after a little dirty but amazing spot in New York whose name I forget). It was the most perfect base, gooey buffalo mozzarella and fresh basil, and just as it came out of the oven it was dressed with rustic freshly chopped tomatoes that had been marinating in olive oil, salt, basil and a barely there hint of garlic. Heaven.